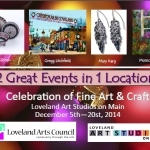 The Loveland Arts Council Winter Show will be held in conjunction with the Loveland Artist Studios on Main building. December 5th through December 20th 2014. Open to all artists age 18 or older to exhibit up to four pieces of original artwork. For full information, download the Winter Show Application. 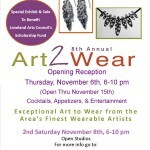 Join us for the 8th annual Art2Wear show held in our gallery. The show starts with an opening reception on Thursday November 6th from 6 to 10pm including cocktails, appetizers, and entertainment. 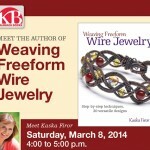 2nd Saturday Open House, Saturday November 8th from 6 to 10pm. The show will be open through November 15th. Display your wearable art in the Loveland Artist Studios on Main gallery from November 6 through 15th. 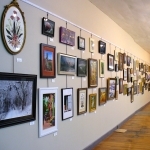 Art work can be for sale or just for display. For full information and to enter, download and complete the Art2WearCalltoArtists form. 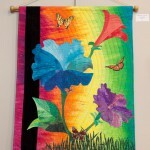 Fiber Art Show held in our gallery in 2011. Felted, rug hooked, and other methods of creating fiber artworks were displayed.